Summer in the foothills – I am not sure there is anywhere better at this time of year. Sunshine, blue skies, cooling breezes, mountain walks, picnics by the river or mountain lakes, cycling to favourite cafés, markets teeming with local produce, restaurant terraces full to bursting and a holiday atmosphere everywhere. In addition, the property market here is very busy with some excellent value properties for sale. International buyers are out in force looking to snap up the chance of buying their home in France while the exchange rate and mortgage rates are still in their favour and house prices are bumping along the bottom. Who knows what will happen in the next few years post Brexit (does anyone?) but my guess is that life will go on. 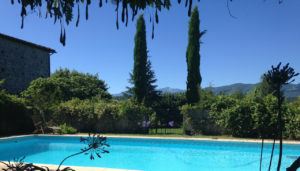 If you are looking to buy a property in France for quality of life reasons then I am still very confident that you could do a lot worse than invest in what is definitely one of the most beautiful regions of France with just about everything you could want on your doorstep and a wide range of property at fantastic value. Have a great summer wherever you are. « How safe is the house buying process in France?